As a direct response to increased European presence in the interior a new Shona state emerged, known as the Rozwi Empire (1684–1834). Relying on centuries of military, political and religious development, the Rozwi (meaning "destroyers") expelled the Portuguese from the Zimbabwean plateau by force of arms. They continued the stone-building traditions of the Zimbabwe and Mapungubwe kingdoms while adding muskets to their arsenal and recruiting a professional army to defend recent conquests. Several airlines pulled out of Zimbabwe between 2000 and 2007. Australia's Qantas, Germany's Lufthansa, and Austrian Airlines were among the first to pull out and in 2007 British Airways suspended all direct flights to Harare. The country's flagship airline Air Zimbabwe, which operated flights throughout Africa and a few destinations in Europe and Asia, ceased operations in February 2012. As of 2017, several major commercial airlines had resumed flights to Zimbabwe. ^ a b McKenzie, David; Swails, Brent; Dewan, Angela. "Zimbabwe in turmoil after apparent coup". CNN. Retrieved 15 November 2017. ^ ___. "BREAKING- Record 23 Presidential Candidates For Zimbabwe's July 30 Polls | ZimEye". Retrieved 17 January 2019. ^ Mabhena, Charles (2 August 2018). "BREAKING NEWS: Emerson Mnangagwa wins Zimbabwe Presidential Elections 2018, ZEC". ZWNEWS | Zimbabwe News | Latest Zimbabwe | Zim News Latest | Zim Latest News | Zimnews. Retrieved 17 January 2019. ^ "Zim ConCourt dismisses MDC's challenge, confirms Mnangagwa winner - SABC News - Breaking news, special reports, world, business, sport coverage of all South African current events. Africa's news leader". www.sabcnews.com. Retrieved 17 January 2019. ^ "Top Zimbabwe court confirms Mnangagwa's presidential election victory". Reuters. 25 August 2018. Retrieved 17 January 2019. ^ Matyszak, Derek (20 September 2017). "Zimbabwe's shady police roadblocks reflect its failing governance - ISS Africa". ISS Africa. Retrieved 22 September 2017. ^ "Zimbabwe diamond exports fell 34 pct in 2014: official". Reuters. 14 May 2015. Retrieved 11 April 2019. ^ Mumera, Wisdom (9 January 2016). "Zimbabwe's Coffee Production Declines". newsofhesouth.com. ^ "African theatre - Southern and South Africa | art". Encyclopedia Britannica. Retrieved 19 January 2018. ^ a b "Zimbabwe in 10 numbers". BBC News. 18 November 2017. Retrieved 18 November 2017. ^ "World Population Prospects – Population Division – United Nations". Retrieved 15 July 2017. ^ a b c d "Gender Equality | UN in Zimbabwe". www.zw.one.un.org. Retrieved 2 October 2018. ^ a b c d "Effective law and policy on gender equality and protection from sexual and gender-based violence in disasters – Zimbabwe". International Federation of Red Cross and Red Crescent Societies. Retrieved 18 October 2018. ^ a b c "7. Women's Empowerment, Gender Equality and Equity | UN in Zimbabwe". www.zw.one.un.org. Retrieved 18 October 2018. ^ a b c d e Chabaya, O.; Rembe, S.; Wadesango, N. (1 January 2009). "The persistence of gender inequality in Zimbabwe: factors that impede the advancement of women into leadership positions in primary schools". South African Journal of Education. 29 (2). ISSN 2076-3433. ^ a b c d "National gender profile of agriculture and rural livelihoods: Zimbabwe | FAO". www.fao.org. Retrieved 25 October 2018. ^ a b "CountrySTAT - Zimbabwe". countrystat.org. Retrieved 18 October 2018. ^ a b c d e f g h "Why the world must pay attention to violence against women and girls in Zimbabwe". The Independent. Retrieved 26 November 2018. ^ a b "Violence impedes women participation in politics - NewsDay Zimbabwe". www.newsday.co.zw. Retrieved 26 November 2018. ^ a b "A Campaign to Make Every Woman Count in Zimbabwe's Next Election". Women and Girls. Retrieved 26 November 2018. ^ a b c "Life After Mugabe: Women in Zimbabwe Push for Political Power". Pacific Standard. Retrieved 27 November 2018. ^ a b c d e Manyonganise, Molly (2015). "Oppressive and liberative: A Zimbabwean woman's reflections on ubuntu". Verbum et Ecclesia. 36 (2): 1–7. doi:10.4102/VE.V36I2.1438. ISSN 2074-7705. Retrieved 4 December 2018. ^ "Zimbabwe". www.unaids.org. Retrieved 4 December 2018. The 2003 Cricket World Cup (known officially as ICC Cricket World Cup 2003) was the eighth Cricket World Cup, organized by the International Cricket Council (ICC). It was co-hosted by South Africa, Zimbabwe and Kenya from 9 February to 23 March 2003. This edition of the World Cup was the first to be played in Africa. The tournament featured 14 teams, the largest number in the World Cup's history at the time, playing a total of 54 matches. It followed the format introduced in the 1999 Cricket World Cup, with the teams divided into two groups, and the top three in each group qualifying for the Super Sixes stage. The tournament saw numerous upsets, with South Africa, Pakistan, West Indies and England all being eliminated at the group stage (South Africa missed by 1 run after misreading the Duckworth-Lewis method rules). England forfeited their match with Zimbabwe, due to the political unrest in the country, which ultimately enabled that team to reach the Super Sixes. Similarly, New Zealand forfeited their match with Kenya, due to security reasons which enabled the latter to reach the semi-finals, the only non-Test playing nation to do so. Another shock wave came two days after the tournament had started, when Shane Warne, at the time one of the game's leading spinners, was sent home in disgrace after testing positive for a banned substance.The tournament was eventually won by Australia who won all 11 of their matches, beating India in the final played at the Wanderers Stadium in Johannesburg. This was Australia’s third World Cup win, the only team to do so. Econet Wireless is a diversified telecommunications group with operations and investments in Africa, Europe, South America and the East Asia Pacific Rim, offering products and services in the core areas of mobile and fixed telephony services, broadband, satellite, optical fiber networks and mobile payment.The group's subsidiaries include Econet Global, Econet Wireless Africa, Econet Wireless International, Econet Enterprises, Liquid Telecom Group and Econet Media. Energy in Zimbabwe is a serious problem for the country. Mainly, extensive use of firewood leads to deforestation and the electricity production capacity is too low for the current level of consumption. Great Zimbabwe is a ruined city in the south-eastern hills of Zimbabwe near Lake Mutirikwe and the town of Masvingo. It was the capital of the Kingdom of Zimbabwe during the country's Late Iron Age. Construction on the monument began in the 11th century and continued until the 15th century. The edifices were erected by the ancestral Shona. The stone city spans an area of 7.22 square kilometres (1,780 acres) which, at its peak, could have housed up to 18,000 people. It is recognised as a World Heritage site by UNESCO. Great Zimbabwe is believed to have served as a royal palace for the local monarch. As such, it would have been used as the seat of political power. Among the edifice's most prominent features were its walls, some of which were over five metres high. They were constructed without mortar (dry stone). Eventually, the city was abandoned and fell into ruin. The earliest known written mention of the Great Zimbabwe ruins was in 1531 by Vicente Pegado, captain of the Portuguese garrison of Sofala, on the coast of modern-day Mozambique, who recorded it as Symbaoe. The first confirmed visits by Europeans were in the late 19th century, with investigations of the site starting in 1871. Later, studies of the monument were controversial in the archaeological world, with political pressure being put upon archaeologists by the government of Rhodesia to deny its construction by native African people. Great Zimbabwe has since been adopted as a national monument by the Zimbabwean government, and the modern independent state was named after it. The word great distinguishes the site from the many hundreds of small ruins, now known as "zimbabwes", spread across the Zimbabwe Highveld. There are 200 such sites in southern Africa, such as Bumbusi in Zimbabwe and Manyikeni in Mozambique, with monumental, mortarless walls; Great Zimbabwe is the largest of these. Harare (; officially Salisbury until 1982) is the capital and most populous city of Zimbabwe. The city proper has an area of 960.6 km2 (371 mi2) and an estimated population of 1,606,000 in 2009, with 2,800,000 in its metropolitan area in 2006. Situated in north-eastern Zimbabwe in the country's Mashonaland region, Harare is a metropolitan province, which also incorporates the municipalities of Chitungwiza and Epworth. The city sits on a plateau at an elevation of 1,483 metres (4,865 feet) above sea level and its climate falls into the subtropical highland category. The city was founded in 1890 by the Pioneer Column, a small military force of the British South Africa Company, and named Fort Salisbury after the British prime minister Lord Salisbury. Company administrators demarcated the city and ran it until Southern Rhodesia achieved responsible government in 1923. Salisbury was thereafter the seat of the Southern Rhodesian (later Rhodesian) government and, between 1953 and 1963, the capital of the Central African Federation. It retained the name Salisbury until 1982, when it was renamed Harare on the second anniversary of Zimbabwean independence. Harare is Zimbabwe's leading political, financial, commercial, and communications centre, as well as a trade centre for tobacco, maize, cotton, and citrus fruits. Manufacturing, including textiles, steel, and chemicals, are also economically significant, as is local gold mining. The University of Zimbabwe, the country's oldest university, is located in Harare, as are several other colleges and universities. The city is home to Harare Sports Club, the country's main Test cricket ground, as well as Dynamos F.C., the country's most successful association football team. Harare's infrastructure and government services have worsened in recent years, and the city has been ranked as one of the least livable cities out of 140 assessed. Khami (also written as Khame, Kame or Kami) is a ruined city located 22 kilometres west of Bulawayo, in Zimbabwe. It was once the capital of the Kalanga Kingdom of Butwa of the Tolwa dynasty. It is now a national monument, and became a UNESCO World Heritage Site in 1986. The Reserve Bank of Zimbabwe is the central bank of Zimbabwe headquartered in the capital city of Zimbabwe, Harare. Rhodesia (, ) was a country in southern Africa from 1965 to 1979, equivalent in territory to modern Zimbabwe. Rhodesia was the de facto successor state to the British colony of Southern Rhodesia, which had been self-governing since achieving responsible government in 1923. A landlocked nation, Rhodesia was bordered by South Africa to the south, Bechuanaland (later Botswana) to the southwest, Zambia to the northwest, and Mozambique (a Portuguese province until 1975) to the east. In the late 19th century, the territory north of the Transvaal was chartered to the British South Africa Company, led by Cecil Rhodes. Rhodes and his Pioneer Column marched north in 1890, acquiring a huge block of territory that the company would rule until the early 1920s. In 1923, the company's charter was revoked, and Southern Rhodesia attained self government and established a legislature. Between 1953 and 1963, Southern Rhodesia was joined with Northern Rhodesia and Nyasaland in the Federation of Rhodesia and Nyasaland. The decolonisation of Africa in the early 1960s alarmed a significant proportion of Rhodesia's white population. In an effort to delay the transition to black majority rule, Rhodesia's predominantly white government issued its own Unilateral Declaration of Independence (UDI) from the United Kingdom on 11 November 1965. (The government of the United Kingdom supported Rhodesia's transition to a multiracial democracy.) The UDI administration initially sought recognition as an autonomous realm within the Commonwealth of Nations, but reconstituted itself as a republic in 1970. The Rhodesian Bush War, which pitted the government against two African nationalist organisations, ZANU and ZAPU, intensified in the 1970s, prompting Rhodesian premier Ian Smith to concede to multiracial democracy in 1978. However, a provisional government subsequently headed by Smith and his moderate colleague Abel Muzorewa failed in appeasing international critics or halting the bloodshed. By December 1979, Muzorewa had replaced Smith as Prime Minister and secured an agreement with the militant nationalists, allowing Rhodesia to briefly revert to colonial status pending elections under a universal franchise. It finally achieved internationally recognised independence in April 1980 as the Republic of Zimbabwe. Rhodesia's largest cities were its capital, Salisbury, and Bulawayo. The white population, which grew to nearly 300,000, dominated the country's politics and economy, though they never made up more than 8% of the total population. Rhodesia developed an economy largely dependent on agriculture, manufacturing, and mining. Its largest exports were chromium, tobacco, and steel. International sanctions put increasing pressure on the country as time went on. The Parliament of Rhodesia, which included the lower House of Assembly and later a senate, was predominantly white, with minority of seats reserved for blacks. After 1970, the country used a semi-presidential system, with a president, prime minister, and cabinet. The Rhodesian Bush War—also called the Second Chimurenga and the Zimbabwe War of Liberation—was a civil conflict from July 1964 to December 1979 in the unrecognised country of Rhodesia (later Zimbabwe-Rhodesia). The conflict pitted three forces against one another: the Rhodesian government, led by Ian Smith (later the Zimbabwe-Rhodesian government of Bishop Abel Muzorewa); the Zimbabwe African National Liberation Army, the military wing of Robert Mugabe's Zimbabwe African National Union; and the Zimbabwe People's Revolutionary Army of Joshua Nkomo's Zimbabwe African People's Union. The war and its subsequent Internal Settlement, signed in 1978 by Smith and Muzorewa, led to the implementation of universal suffrage in June 1979 and the end of white minority rule in Rhodesia, which was renamed Zimbabwe Rhodesia under a black majority government. However, this new order failed to win international recognition and the war continued. Neither side achieved a military victory and a compromise was later reached.Negotiations between the government of Zimbabwe-Rhodesia, the UK Government and Mugabe and Nkomo's united "Patriotic Front" took place at Lancaster House, London in December 1979, and the Lancaster House Agreement was signed. The country returned temporarily to British control and new elections were held under British and Commonwealth supervision in March 1980. ZANU won the election and Mugabe became the first Prime Minister of Zimbabwe on 18 April 1980, when the country achieved internationally recognised independence. Robert Gabriel Mugabe (; Shona: [muɡaɓe]; born 21 February 1924) is a Zimbabwean revolutionary and politician who served as Prime Minister of Zimbabwe from 1980 to 1987 and then as President from 1987 to 2017. He chaired the Zimbabwe African National Union (ZANU) group from 1975 to 1980 and led its successor political party, the ZANU – Patriotic Front (ZANU–PF), from 1980 to 2017. Ideologically an African nationalist, during the 1970s and 1980s he identified as a Marxist–Leninist, although after the 1990s self-identified only as a socialist. His policies have been described as Mugabeism. Mugabe was born to a poor Shona family in Kutama, Southern Rhodesia. Following an education at Kutama College and the University of Fort Hare, he worked as a school teacher in Southern Rhodesia, Northern Rhodesia, and Ghana. Angered that Southern Rhodesia was a colony of the British Empire governed by its white minority, Mugabe embraced Marxism and joined African nationalist protests calling for an independent black-led state. After making anti-government comments, he was convicted of sedition and imprisoned between 1964 and 1974. On release, he fled to Mozambique, established his leadership of ZANU, and oversaw ZANU's role in the Rhodesian Bush War, fighting Ian Smith's predominantly white government. He reluctantly took part in the peace negotiations brokered by the United Kingdom that resulted in the Lancaster House Agreement. The agreement ended the war and resulted in the 1980 general election, at which Mugabe led ZANU-PF to victory. As Prime Minister of the newly renamed Zimbabwe, Mugabe's administration expanded healthcare and education and—despite his professed Marxist desire for a socialist society—adhered largely to mainstream, conservative economic policies. Mugabe's calls for racial reconciliation failed to stem growing white emigration, while relations with Joshua Nkomo's Zimbabwe African People's Union (ZAPU) also declined. In the Gukurahundi of 1982–1985, Mugabe's Fifth Brigade crushed ZAPU-linked opposition in Matabeleland in a campaign that killed at least 10,000 people, mostly Ndebele civilians. Internationally, he sent troops into the Second Congo War and chaired the Non-Aligned Movement (1986–89), the Organisation of African Unity (1997–98), and the African Union (2015–16). Pursuing decolonisation, Mugabe emphasised the redistribution of land controlled by white farmers to landless blacks, initially on a "willing seller–willing buyer" basis. Frustrated at the slow rate of redistribution, from 2000 he encouraged black Zimbabweans to violently seize white-owned farms. Food production was severely impacted, leading to famine, drastic economic decline, and international sanctions. Opposition to Mugabe grew, although he was re-elected in 2002, 2008, and 2013 through campaigns dominated by violence, electoral fraud, and nationalistic appeals to his rural Shona voter base. In 2017, members of his own party ousted him in a coup, replacing him with former Vice President Emmerson Mnangagwa. Having dominated Zimbabwe's politics for nearly four decades, Mugabe is a controversial figure. He has been praised as a revolutionary hero of the African liberation struggle who helped to free Zimbabwe from British colonialism, imperialism, and white minority rule. Conversely, in governance he has been accused of being a dictator responsible for economic mismanagement, widespread corruption, anti-white racism, human rights abuses, and crimes against humanity. The colony was established in 1923, having earlier been administered by the British South Africa Company. In 1953, it was merged into the Federation of Rhodesia and Nyasaland, which lasted until 1963. Southern Rhodesia then remained a de jure British colony until 1980. However, the white-minority government issued a Unilateral Declaration of Independence (UDI) in 1965 and established Rhodesia, an unrecognised state. In 1979, it reconstituted itself under indigenous African rule as Zimbabwe Rhodesia, which also failed to win overseas recognition. After a period of interim British control following the Lancaster House Agreement in December 1979, the country achieved internationally recognised independence as Zimbabwe in April 1980. The wildlife of Zimbabwe occurs foremost in remote or rugged terrain, in national parks and private wildlife ranches, in miombo woodlands and thorny acacia or kopje. The prominent wild fauna includes African buffalo, African bush elephant, black rhinoceros, southern giraffe, African leopard, lion, plains zebra, and several antelope species.The introduction of the Wildlife Conservation Act of 1960 resulted in checking the loss of wildlife in Zimbabwe, since the 1960s. In the 1990s, it became one of the leading countries in Africa in wildlife conservation and management with a reported income generation US$300 million per year from the protected areas of the state, rural community run wildlife management areas and private game ranches and reserves. The Parks and Wildlife Board consisting of 12 members is responsible for this activity and deciding on policy issues under the Ministry of Environment and Natural Resources Management.The Zimbabwe Parks and Wildlife Management Authority under the Board has the onerous task of overseeing the activities related to 10 national parks, nine recreational parks, four botanical gardens, four safari areas, and three sanctuaries. These areas are collectively called the Wildlife Estate which covers an area about 47,000 km2 (18,000 sq mi), which is equivalent to 12.5% of the total land area of the country.However, reports of National Geographic News indicate a disturbing trend of decimation of wildlife in Zimbabwe as result of “national economic meltdown” leading to overexploitation of the wildlife resources to meet the finances of the nation. 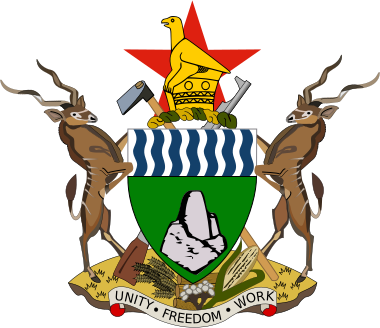 The Zimbabwe African National Union – Patriotic Front (ZANU–PF) is a centre-left political organization, which has been the ruling party of Zimbabwe since independence in 1980. The party was led for many years under Robert Mugabe, first as Prime Minister with the Zimbabwe African National Union (ZANU) and then as President from 1987 after the merger with the Zimbabwe African People's Union (ZAPU) and retaining the name ZANU–PF, until 2017 when he was removed as leader. At the 2008 parliamentary election, the ZANU–PF lost sole control of parliament for the first time in party history and brokered a difficult power-sharing deal with the Movement for Democratic Change – Tsvangirai (MDC), but subsequently won the 2013 election and gained a two-thirds majority. On 19 November 2017, ZANU-PF sacked Robert Mugabe as party leader, who resigned two days later, and appointed former Vice President Emmerson Mnangagwa in his place. The Zimbabwe national cricket team is administered by Zimbabwe Cricket (formerly known as the Zimbabwe Cricket Union or ZCU). Zimbabwe is a full member of the International Cricket Council (ICC) with Test and One Day International status. As of November 2018, Zimbabwe is ranked tenth in Tests, eleventh in ODIs and twelfth in Twenty20 Internationals by the ICC. The Zimbabwe national football team is the national team of Zimbabwe and is controlled by the Zimbabwe Football Association (ZIFA), formerly known as the Football Association of Rhodesia. The team has never qualified for the World Cup finals, and qualified for their first Africa Cup of Nations in 2004. The Zimbabwean dollar (sign: $, or Z$ to distinguish it from other dollar-denominated currencies) was the official currency of Zimbabwe from 1980 to 12 April 2009. During this time, it was subject to periods of above-average inflation, followed by a period of hyperinflation.The Zimbabwean dollar was introduced in 1980 to directly replace the Rhodesian dollar (which had been introduced in 1970) at par (1:1), at a similar value to the US dollar. Over time, hyperinflation in Zimbabwe reduced the Zimbabwe dollar to one of the lowest valued currency units in the world. It was redenominated three times (in 2006, 2008 and 2009), with denominations up to a $100 trillion banknote issued. The final redenomination produced the "fourth dollar" (ZWL), which was worth 1025 ZWD (first dollars). Use of the Zimbabwean dollar as an official currency was effectively abandoned on 12 April 2009. It was demonetised in 2015, with outstanding accounts able to be reimbursed until April 30, 2016. In place of the Zimbabwean dollar, currencies including the South African rand, Botswana pula, pound sterling, Indian rupee, euro, Japanese yen, Australian dollar, Chinese yuan, and the United States dollar are now regularly used.